In the tradition of Tiffany craftsmanship, we bring you magnificent Tiffany Forged Signature Series; each piece has been created especially for your exceptional coastal home by master craftsman as a "one of a kind" work of art. Nothing complements Nature like lighting that depicts the waterfront setting. Custom crafted in Antique Copper finish while adorning a Silver Mica shade. 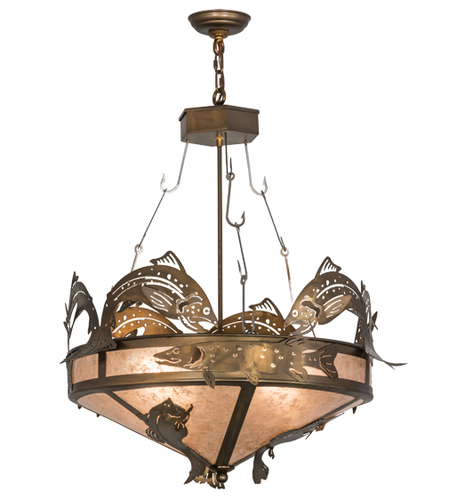 The chandelier is suspended with an interlocking fishhook chain from a hub above. Quality handcraftsmanship, decorative detail and inspiring designs combine to create indoor lighting that has never been more perfect for your exceptional home. Total Height: 35-66" Total Width: 24"
Uses 4 x 100 watt bulbs and includes a Canopy and 30" of chain. Custom made for you. Not eligible for return or exchange. Please view our return policy for more information. Ships USPS ground.